Surprise! I ran a marathon this weekend. Although some people knew, I tried to keep it mostly private to avoid extra pressure for the race. Of course, my intent was to qualify for Boston at this race and I picked it with the help of my coach via text within an hour of my DNF at Eugene. 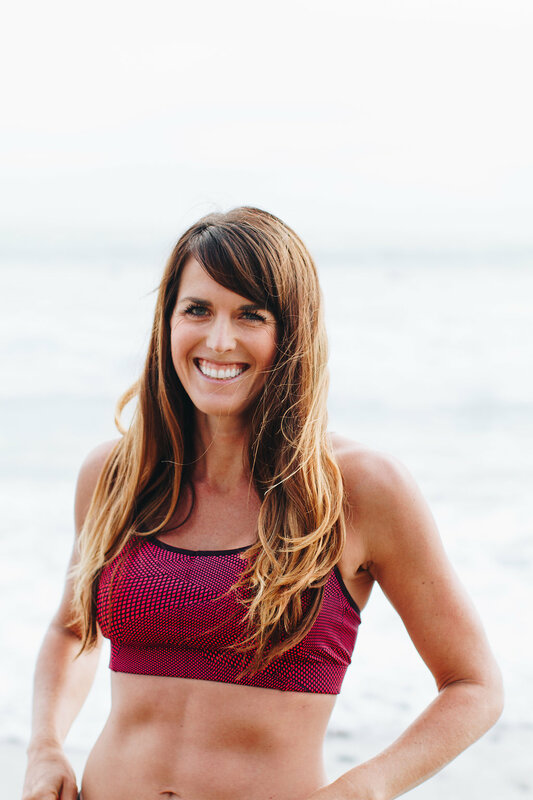 Originally I’d thought I’d race Mountains to Beach Marathon (know to be a big BQ race) but it was sold out and I considered San Diego RnR but I knew that race would be crazy crowded too and I already have plans to be out of town that weekend. My coach said OC would be fine – would be good actually since it was only one week out and we could just add on to my taper from Eugene. I actually had run my last 20 mile run 2 weeks before Eugene so it would just be a fairly average 3 week taper (with an extra light 2nd week). Since I grew up in Orange County, I have friends and family there so Mike and I ended up cooking my usual pre-race pasta dinner at my friend (and bridesmaid) Jill’s house with her husband and our mutual friend (and also bridesmaid) Jenny. I’d actually already had plans with them that day – they were going to come to San Diego for a visit – so it worked out well. My Dad and Step Mom could be there on the course to cheer me on and my Mom could make it to the finish line. I told close friends and coworkers as well as some people at Eugene about the race, but I didn’t make a peep on Twitter, Facebook or my blog about the race. I had some race jitters the day before but not nearly as bad as the heart pounding anxiety I had while trying to fall asleep the night before Eugene.My main concern going into the race was the crazy winds that were ripping through Southern California. The forecast showed up to 15 mph winds on race day. Based on the direction, I guessed they’d be at my back for the majority of the race but I knew that the final 6 miles would be into the wind so that made me nervous. Race morning came EARLY because the marathon start was 5:30 A.M. My assigned shuttle from the finish to the start was 4 a.m. so instead I had Mike drop me off at the start line around 4:40ish. It was odd to be at a race completely alone but it was also calming. No pressure. I used the bathroom 3 times (for future racers – there are some porto-potties near the runner drop off that have no lines – the ones near the bus drop off got long! ), warmed up and got in my corral – Corral 1. I noted that the 3:35 pacer was in my corral but didn’t pay attention to him otherwise because I didn’t plan to use him. I basically started five rows back from the front and due to the fact that the vast minority of runners do the full marathon (about 2,000 compared to 8,000 in the half), it was not crowded at all at the start. Since the first few miles had some downhill, my plan was to cruise but not go faster than an 8 minute mile for the first five. Then I was to back it down to an 8:10 then pick it up to 8 min/miles for 10-20, then give it all I had for the final 10k (coach’s instructions – 7:50 pace). Same as Eugene, my estimated finish time was around 3:30. The first mile felt pretty good. I knew going into it that there were some inclines on that first mile so I should not be worried if my pace was slower than 8:10 since the next mile would definitely be faster. We ran through the parking lot of the mall and up some slight inclines and as my legs warmed up they felt better. The first mile ticked off on my Garmin at 8:15. Not bad. As we left the mall and ran toward Corona Del Mar, a beautiful beach side community in Newport Beach, we enjoyed a very nice long downhill portion. 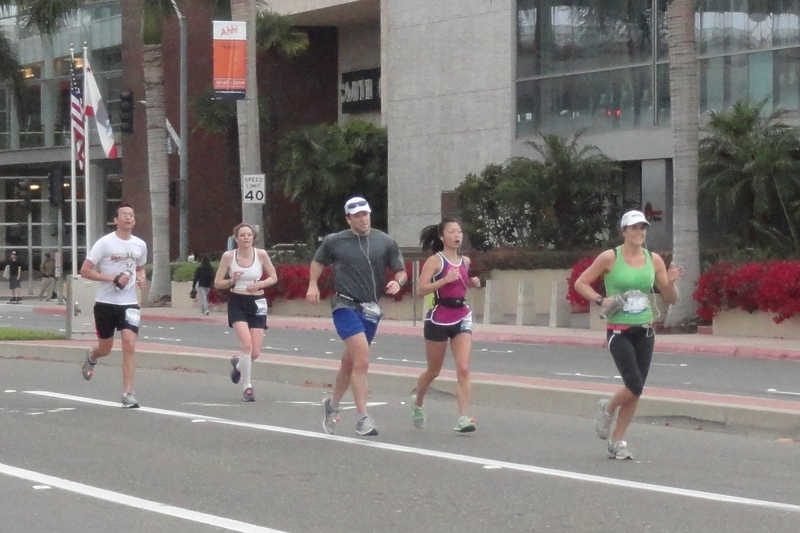 This is when the 3:35 pacer passed me while I was running in a the mid-high 7s, so I didn’t try to keep up. Mile 2 ticked off 7:51 and I knew I did the right thing not following them. Miles 3 and 4 looked like they were still a bit downhill according to the course elevation but they really seemed to just be full of small rollers. We ran past all the shops in CDM then ran through the neighborhood to the coast, passing gorgeous multi-million dollar homes propped up against the ocean. The headwind was hitting every time we headed South and it was noticeable enough to cause a change in pace depending on which direction I was running. Miles 3 & 4 8:08 and 8:10. Right on track but not as fast as I had hoped. Mike had parked nearby and was running between the streets as we wove through them so I was able to see him at least four or five times during this stretch which was nice. I was in high spirits and feeling good. I shouted at him at one point “right on track.” My Garmin said my average was about 8:07. Miles 5 & 6 felt good – I finished them in 8:00 and 8:09 but also started to realize I was either running the tangents poorly (I swear I was running them perfectly – especially since there weren’t many other runners so I had a direct path and rarely had to weave to pass people) or the course was a little long. Maybe both? Not sure, but already by mile 6 I was about 0.10 behind the mile markers, meaning I knew I’d be running at least 26.3 miles that day, but likely more. My coach had told me even though I could bank some time miles 1-5 because of the declines, I should keep the pace at around 8:10 for 5-10. I remember being thankful for the cool weather and lack of sunlight, but also remaining cautious of the winds. The wind is not your friend. Miles 7 and 8 were the first indicator that it could be a hard race. We were slowly making our way back up that nice decline we had at mile 2 – via a different route, but nonetheless, I knew the uphills were more prevalent than the down. We ran up a path in a small park that led us up to a cliff overlooking a lagoon which was beautiful. Gorgeous homes lined the path and it was very scenic, but I didn’t love the hills. I told myself just to run based on effort and not worry so much about the pace for these miles, and unfortunately that meant the pace was slower than targeted – 8:20 and 8:18. After mile 8 clicked off I knew I had some catching up to do so I picked it up a bit more and knocked off a 7:58 pace for mile 9. My average pace per Garmin was still on track – around 8:07 or so, but I also knew I was getting further behind those mile markers and I had to make up some time. The pace just didn’t feel as easy as I knew it should and around this point was my first indicator that it may not be my day. However, I told myself, rather than slow down now and lose time, I need to at least keep up with my pace, even if it feels faster than it should. Based on my experience at Surf City Marathon where I was able to run a basically even split the entire time (8:47 pace), I knew that miles 1-14 should feel really easy if I was going to be able to maintain or pick up the pace at the end. Unfortunately, they didn’t, but I didn’t give up hope yet. Mile 10 was 8:11, which I told myself was fine since my goal pace was 8:10. I knew it was time to pick it up and Miles 11 and 12 clicked off at 8:02 and 7:58. However, they didn’t feel as easy as they should. Somewhere around this point is when we broke from the half (not that any half marathoners were running since they had a later start time) and this is when the course got significantly less scenic. I’d been warned via the yelp reviews and blogs I’d read about this race so I was prepared, but honestly it was a pretty boring second half! However, I was so in my head with my paces and everything else that it didn’t bother me too much. If you are running this race for “fun” and to get a good view of OC, I’d pick another race. If you are trying to run really fast, I’d also skip it. When I hit 13.1 (13.3 on my watch), I was disappointed that my watch said 1:47:20. Halfway to 3:35 is 1:47:30 so I knew I was cutting it VERY close. I also knew I was already tired. 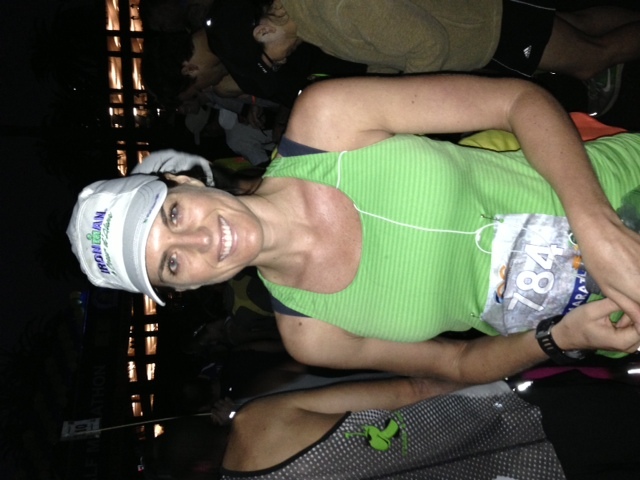 The thought of running another 13.1 miles at the same pace seemed daunting. Just after we crossed the 13.1 marker we hit a pretty big incline and just over the top I saw my Dad and Step Mom for the first time. I tried to act like I wasn’t tired but I had just scaled a big hill so I probably didn’t look that happy! It was great seeing them though and I was glad for their support. Despite a little setback after scaling that hill and knowing I was cutting it close, I reminded myself that this is what I worked for. This is what I put in all those hours of training for. This Moment. Dig Deep, I told myself. You can do this, I reminded myself aloud (I spoke to myself more during this race than I ever have before – maybe the lack of fellow runners/crowds made me feel like it was a good idea?). The next few miles I got some sort of energy boost. Hope crept back into my mind and I just kept telling myself to forget picking up the pace, just focus on maintaining. Mile 17 is when there was a small out and aback and I saw the 3:35 pacer for the first time since mile 2. I thought to myself Catch Them!!! And picked up the pace. Mike saw me sometime around this point and he said that I looked really strong. I was ready to do this. Only 9 miles to go. Not too much longer in the pain cave. Let’s go! The momentum I had at mile 17 slowly waned and Miles 18 and 19 faded to 8:08 and 8:11. Sometime during Mile 19 we ran through a High School parking lot (yes, I kid you not) and that’s when I saw Sarah . She had told me last weekend in Eugene that she’d be at the race to pace another friend so I wasn’t surprised when I saw her. I was getting really tired at this point, and I called out to her. She asked if I wanted to be paced and I said sure! She asked what pace and I said 8 – 8:10. The wind was in our faces at this point so I told her to run in front of me. However, My breathing was too hard, my legs were too heavy, and I was clearly struggling. Although I had literally just been on pace, this was when things went downhill. I knew these evil miles were coming and I’d been mentally preparing for them, but when they arrived, I wasn’t ready for them. Miles 20-24 are down a lonely concrete path next to the river bed. This “river trail” may sound scenic, but really it’s a concrete path next to an empty concrete river bed. We were running south and the wind was in our faces, blowing hard. I couldn’t keep up with Sarah. She was running my pace as I asked her to and I just fell behind. I wasn’t able to draft off of her because she was running too fast (clearly not her fault – my pace was too sporadic to be able to easily run just ahead). Knowing that I had to literally maintain my pace and I had nearly no cushion to work with, this is when I knew what was going to happen. Instead of looking at my watch and freaking out, I just focused on effort. I kept up my effort and just kept chugging along. Sarah was really awesome and gave me words of encouragement and tried to help the best she could, but I was so deep in the pain cave at this point that nothing could help. My thoughts went from BQing to praying for the race to be over. Oddly enough, I was ok knowing my BQ wasn’t going to happen that day. My thoughts were actually surprisingly positive. Every mile marker was a flag that had written on it a reason “Why I Run,” presumably submitted by runners themselves as reasons why they put their body through 26.2 or 13.1 miles. I had been reading them the entire race, but during these miles they were particularly inspiring to me. I focused on the fact that I could run. That running makes me healthier. That running has been the inspiration for this blog which gives me so much joy. That running makes me part of an amazing community. That as long as I didn’t have to walk, I’d still PR. That I was going to finish my 3rd marathon that day. I should be proud no matter what happens. I mentally celebrated the fact that after I crossed that finish line, I didn’t have to think about training for a while. Heck, maybe I didn’t even have to run a marathon ever again!? I just tried to look on the bright side. After pacing me for about 3ish miles, Sarah jumped off and headed back to find her friend to pace. I thanked her for her help. Later I saw her as she passed with Monica (EatRunRepeat) and several other runners and she told me to get in their group and out of the wind (yes still running into a headwind, all alone, since there was no one to draft off of). I tried to keep up, but I just couldn’t. I can’t remember if it was now or another point when I saw Sarah that I told her, “I’m going to finish and I’m going to PR!” letting her know that although the BQ wouldn’t be mine, I’d still be proud. I remember hitting mile 24 and bemoaning the fact that I still had 2 miles to go. 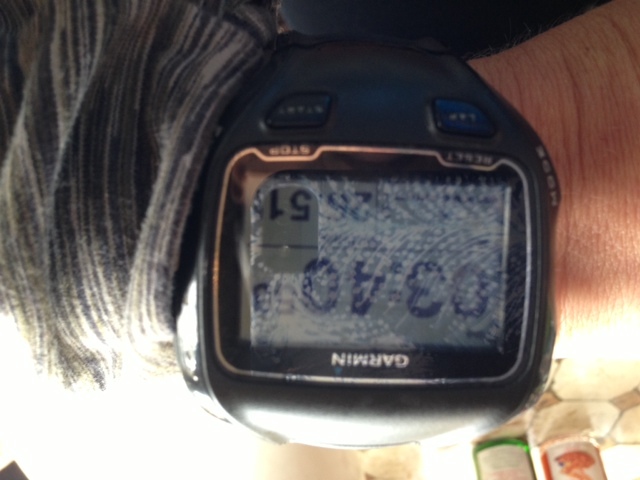 My watch was now nearly 0.30 miles ahead of the mile markers so I knew I would be running at least 26.5 miles that day. My legs were exhausted, my breathing heavy. I had refilled my water bottle 5 times now (I’d take off the cap, run through the chute and pour 4-6 cups of water in it) yet was still so thirsty. I was cramping in my feet and legs so I’d started drinking gatorade (I had put half a Nuun in my bottle around mile 16 but the other half disintegrated my running sleeve). I wanted to walk so bad but I knew I couldn’t. I wanted to PR. I vaguely thought it’d be nice to go sub 3:40 but I really didn’t care enough to push it harder. I just wanted to cross that finish line. I wanted to be done. My family had gone to the finish line so I didn’t see anyone from Miles 20 to the finish. The miles went by in a blur. They seemed so long. I fantasized about finishing and just laying on the grass immediately and drinking gallons of water. I wanted relief. I was in pain. The marathon is a beast. I had forgotten how hard it was to race one. My watch showed that I had run 26.2 miles even before I hit the 26 mile marker. Around this point I also made it through two main roads where they were letting traffic pass and stopping runners. Luckily I wasn’t stopped by I felt for those that did get stopped because I don’t think I could keep going if I had to stop at mile 25.9. 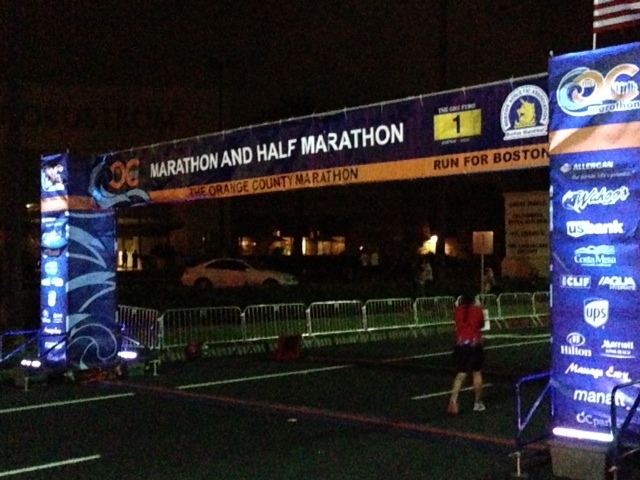 I saw the OC Fairgrounds where the finish line was held and I was so relieved to almost be done. I couldn’t muster up much energy, but I was able to pick it up a little bit at the end (final 0.51 miles 8:13 pace). I saw my Dad first, then heard Mike and my mom cheering me on to my right, then saw my Step Mom just before I crossed the finish line. Relief. THANK YOU Mike for Waking Up at 3:30 AM and Driving/Running All Over Town for Me! My final time was 3:40:52. Under the old standards I would have qualified for Boston. 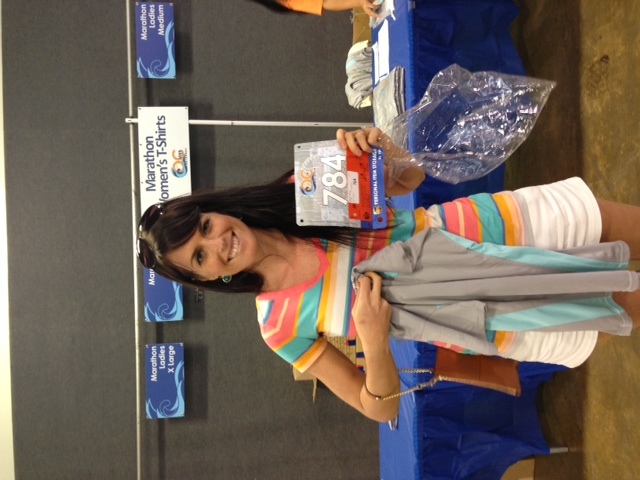 I was 11th in my age group (originally it was 10th! Somehow I got bumped back) and only 5 people in my age group even qualified for Boston. Despite the disappointment that I did not achieve my goal, I am supremely proud of myself for achieving a 9 minute marathon PR and even more proud of finishing the race. The marathon is an incredibly difficult distance – I respect it even more now than I ever have. I’ve read the race reports of friends who tried to BQ and have also failed. All their training and tune up race times indicated they’d do it too and they just didn’t. As to why it didn’t happen for me or for those others, it’s hard to pick just one thing. What I do know is that I’m a much faster runner than I was 7 months ago and that won’t go away. I also believe that my race time doesn’t completely reflect the training I put in, but I’m at peace with that. Look for another post soon with some post-race reflection on what may have gone wrong as well as review of the OC Marathon itself, but for now, I’m going to just continue to celebrate my accomplishment and enjoy some much deserved rest! I am so very proud of you!! That is a significant PR to be proud of. You will get your BQ soon – I know it. While there’s always something to be learned from a race, and potential improvements to be made, I don’t think that a 9-minute PR merits thinking too much about “what went wrong” – there’s probably a lot of “what went right” that, if you keep with it, will lead to even more improvement down the line. You ran an amazing race! Congrats on the PR. Your progress and hard work is worthy of a celebration! YAY! Congratulations on a stellar race!! 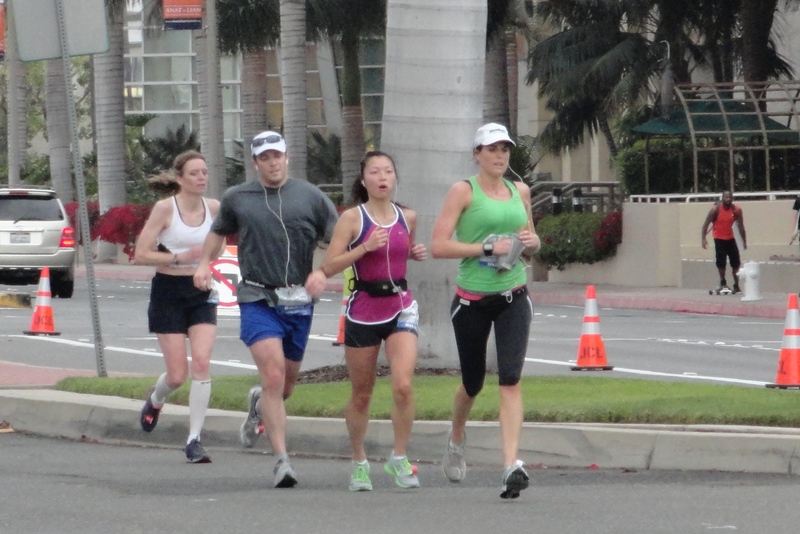 (I had kept checking your DM too see if u ran any marathon this past weekend;) So glad you attacked OC! Not only did you PR, but you totally brushed off last Eugene and didn’t even let it effect u one bit- that’s huge mental win! Now, enjoy recovery! 🙂 and celebrate tons! The best part about this post is not only that you finished, but that you were so positive!! You are one tough woman and am so happy for you! 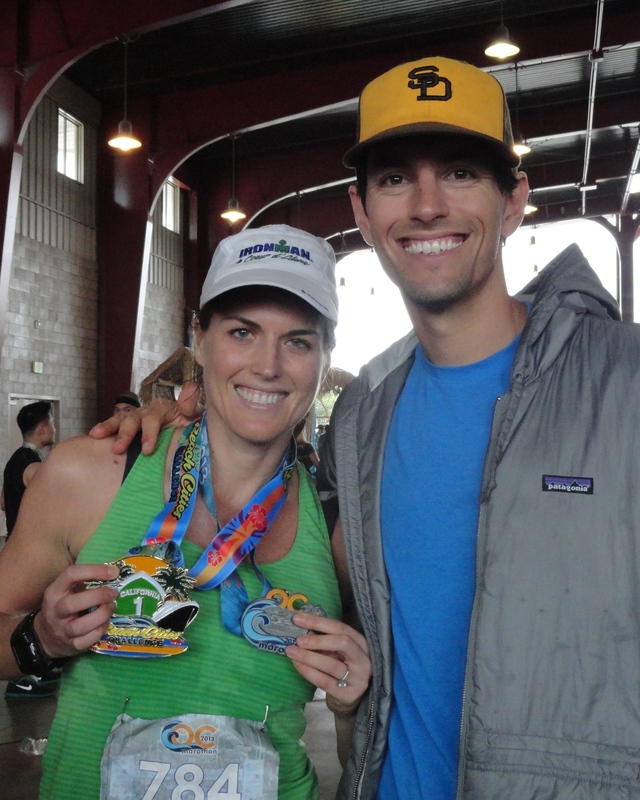 First, how do you look so great after finishing a marathon?! You looked like you hadn’t even started yet 🙂 Second, AMAZING race! A PR is a huge accomplishment (3:40 is a goal that I have tried and failed at 3 times now!). And yes, you are right, the marathon is so unpredictable and there is no explanation why we train so hard and yet come up a little short. It’s funny that you said that in miles 20+ that you knew you wouldn’t BQ, weren’t upset at that point. 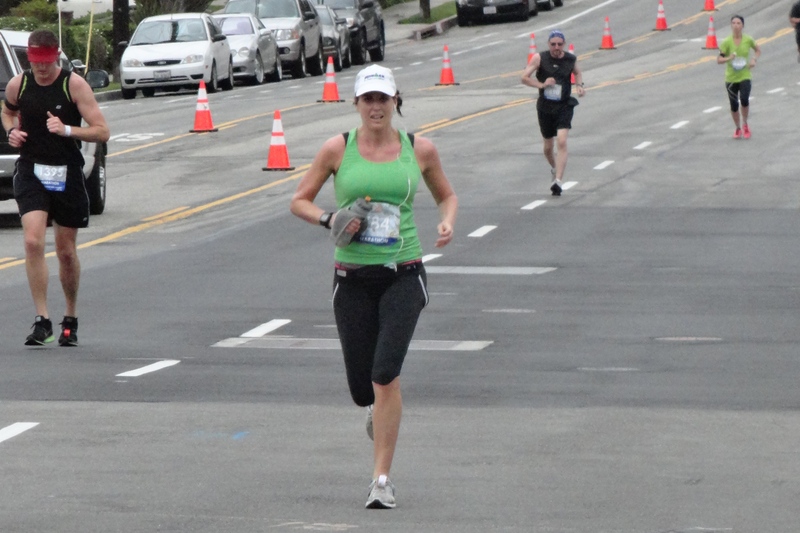 I find myself getting to that same place in every single marathon (well, all 4)…when I just hurt so bad that I feel so proud that I am even still running! I have always thought that was my “giving in”, but I do think our body and brain have to reconcile themselves sometime and just *survive* to finish. Great race! Hope you are recovering well. Looking forward to reading your follow-up posts! Awesome race! You totally have a BQ in you, you just need the stars to align! I found your blog from Sarah at OUAL. I loved reading your race recap and how you capture so many of those feelings we all go through during a tough race. 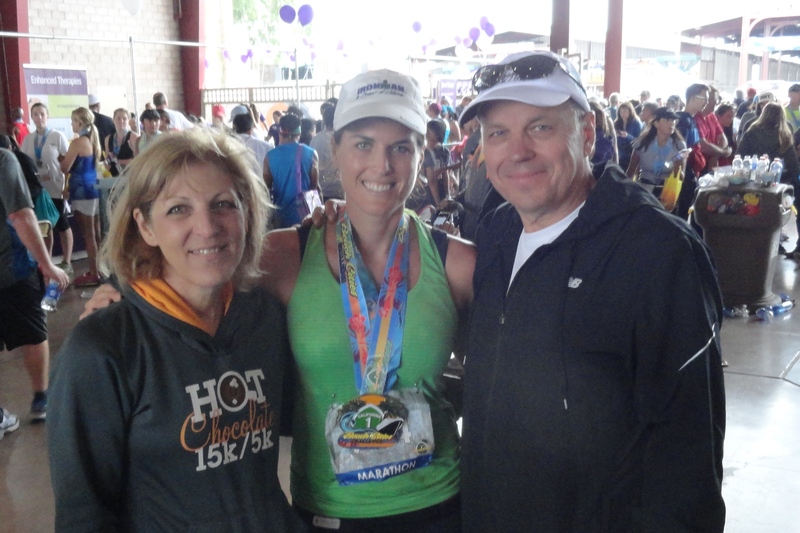 It took me 5 marathons to BQ, then I ran Boston and didn’t even come close to my BQ time. I’ll just keep on trying! Congratulations on the huge PR. Congratulations, Nicole! A 9-minute PR is incredible! I’m glad to hear you’re proud of yourself- you should be more than proud for this accomplishment! Enjoy your rest and recovery! You deserve it. Oh you are so sneaky! 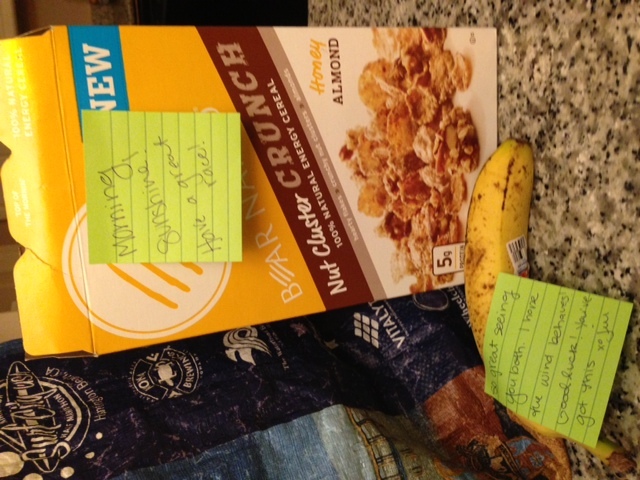 Surprising us unsuspecting readers with a marathon race report! That was a great race report; I really enjoyed reading it. Fantastic job! Amazing progress! Congratulations! Amazing job, Nicole! That is a HUGE PR! And yup, you qualified by the old standards. Who knows if people who BQ will even get into the 2014 race next year anyhow — looks like it is going to sell out big time. Congrats again, what a great race! I know this wasn’t the time you were hoping for, but I think it is amazing. 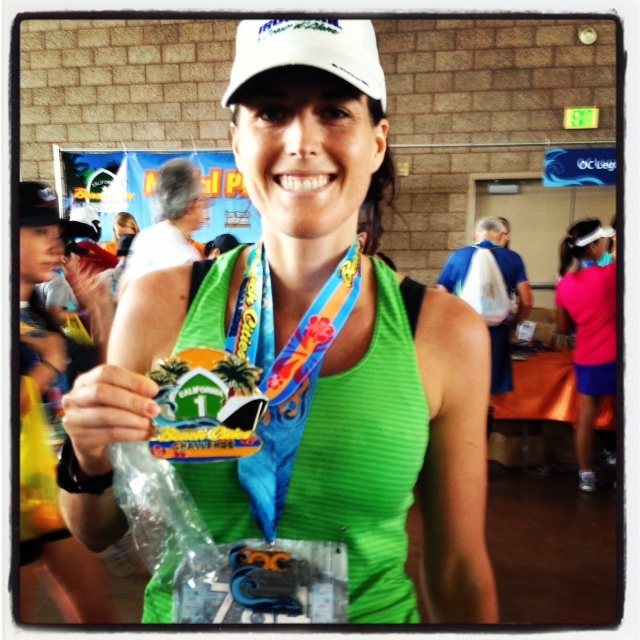 My half marathon PR is what you run in a marathon! Those last 6 miles are the greatest mystery ever. People who can run faster during those last six simply amaze me. I’m proud of your race and that you never gave up even when it got hard. Congrats. You rock!